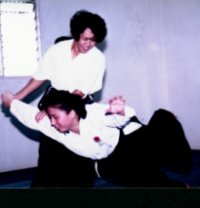 First publication appeared in 1991 by the editorial committee of Aikikai World Aikido Headquarters alias Hombu Dojo(Led by Doshu Moriteru Ueshiba). Mrs. Kimiko Yamada was asked to write for the 19th publication, on her 29 years of life in Malaysia which was published on the 20th January 2000. 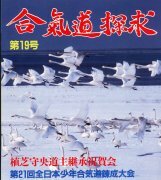 A cover of "Aikido Tankyu Magazine No.19" published by Hombu Dojo since 1991. It is in humility I share some of my life and experiences of 29 years in Malaysia with web browsers. Like fellow humans everywhere in this world, most of life daily experiences for me during those period consisted of going through routine activities which we human perform daily without thinking. However, if I was to summarize my emotions and feelings during those years, I would say they were filled with moments of happiness and sadness. Happiness - because I am with my beloved husband Abd. Rashid Yamada dedicating ourselves to the spread of Aikido in a foreign country. No one knows what "Aikido"is untill my husband came in 1971. Sadness - because of being away from family and friends in our country,Japan. There was seldom many contacts between me and my family members except with Hombu Dojo - Sensei H.Somemiya, Shihan Fujita and others, with whom we maintain constant contact. Living here in this country made me understand the Malaysian people way of thinking and their beliefs. Malaysian people consisted of various ethnic groups - the native Malays and Dayaks, the Chinese, Indians and numerous other small groups. Generally everyone in the Malaysia Aikido community understands the true spirit of Aikido. Discipline, harmony and peace, live whatever areas racial origins are amongst Aikido practitioners. It is true that, like in other countries, there are still some Aikido practitioners, who insisted in trying to do things their own way, even against established rules set by Hombu Dojo. These people do not yet fully understand the true spirit of Aikido. Academy Aikido Jyuku is the national aikido organization, which truly represents the teachings of Aikido's Founder, as propagated worldwide today by Hombu Dojo. It is a society registered with the Government of Malaysia and recognized both by the International Aikido Federation and Hombu Dojo. Member Dojos of Academy Aikido Jyuku are found nationwide from Kuching in East Malaysia to the states of Peninsula Malaysia. We are confident that the new millennium year will usher in greater spread of Aikido in Malaysia by as more activities are planned. Lastly I would like to express my gratitude to Hombu Dojo's Tankyu Magazine for giving me the rare honour of writing for the magazine. And it is also opportune that I am able to provide the long history of Malaysia Aikikai to web bropwsers simultaneously. 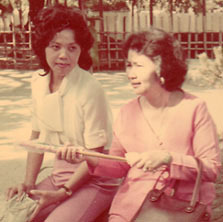 First homecoming with Datin Normah, June 1973. Picture taken at the Golden Pavilon"Kinkakuji" in Kyoto. 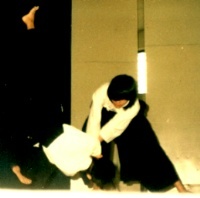 Mrs. Kimiko performing a technique at the HIKMAH Dojo. 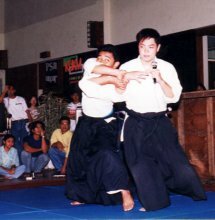 Aikido at his University in Bandung, Indonesia. 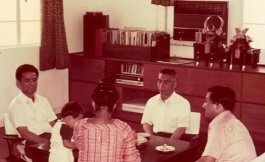 Day Celebration at Yamada Shihan's residence in February 1974. 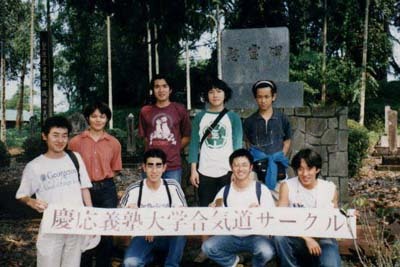 Demonstration at St.Teresa School by Ms Sae Yamada in 1989.
was taken at a Japanese graveyard in 1998.